The Canadian pot grower fell alongside the rest of the marijuana sector. Here's what you need to know. Shares of Canopy Growth Corporation (NYSE:CGC) were sliding last month as the stock tumbled after Canada legalized recreational marijuana on Oct. 17, falling with the rest of the cannabis sector on a buy-the-rumor/sell-the-news type of event. Leading up to the legalization date, many believed that marijuana stocks were in a bubble, as the sector had soared following Constellation Brands' (NYSE:STZ) blockbuster $4 billion investment in Canopy. And there seemed to be some truth to that as marijuana stocks widely fell after the legalization date. According to data from S&P Global Market Intelligence, Canopy shares fell 24% last month, though they were up more than 15% at one point. 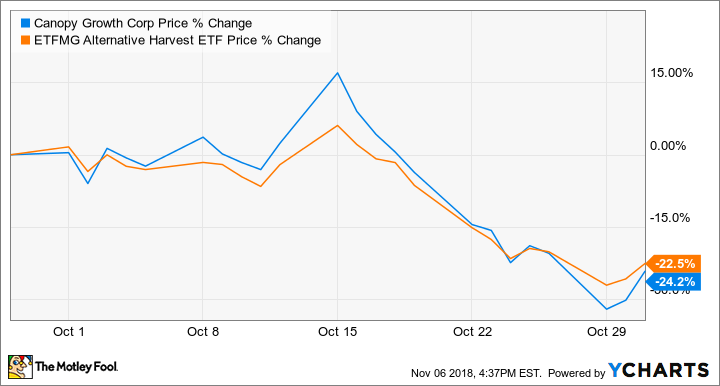 As the chart below shows, shares fell almost daily after the Oct. 15 inflection point, tracking with the marijuana ETF, ETFMG Alternative Harvest ETF (NYSEMKT:MJ) for nearly the entire month. Marijuana stocks reached a fever pitch in September and early October as excitement built for Canadian legalization, which investors hoped would influence more U.S. states and the federal government to follow suit. Canopy shares were no different, as the stock doubled from the announcement of Constellation's investment in August to its peak in October. The Canadian pot grower continued to forge new partnerships and expand in October. Among those moves, the company partnered with the Ontario Long Term Care Association on a pilot study for medical cannabis in seniors. It also increased its licensed platform to 4.3 million square feet of growing space, and the company made its first legal medical cannabis export from Canada to the U.S. It also acquired the assets of Colorado-based hemp research firm ebbu, introduced the LBS brand in Canada, and sold new shares to fund buying a stake in a Manitoba cannabis retailer. Despite all those moves, the stock tracked with the market's sentiment on marijuana stocks as the sector has been overwhelmingly driven by traders in recent months. News stories about pot supplies not being enough to meet demand in the first days of Canadian legalization, indicating the industry was not ready for legalization, also may have weighed on the sector. After a dismal October, marijuana stocks are recovering in November as investors spy opportunity again. Canopy shares are already up 15% this month. Again, there was no major news driving the movement, though Constellation's deal with Canopy closed on Nov. 1, giving the Canadian marijuana grower a cool $4 billion to work with. Pot stocks did surge on Election Day, perhaps in anticipation of favorable results for marijuana initiatives on several state ballots. Canopy's second-quarter report should come out in the next week or so, offering investors their first look at a post-legalization world. But expect shares to remain volatile as valuations are still sky-high.